Nerf toy guns have brought endless hours of fun to generations of kids. Today's editions pack a powerful combination of distance, complexity, and affordability into a wide range of models and styles. Nerf guns fire soft foam darts or discs, which makes "warfare" safe for kids of all ages. Many of today's toy guns feature a neon color scheme made out of durable and whimsical looking plastic. The term "Nerf Blaster" is used as a generic description of Nerf toy guns. Blasters can include pistols and rifles, some of which use batteries to increase their firepower. The most popular line of Nerf blasters is the N-Strike Elite guns. The Nerf N-Strike Elite Centurion is the first gun to use mega darts, which are larger sized to allow for a shooting range of up to 100 feet. The darts have a velocity of 55 mph and make a whistling noise as they fly across the room. The Centurion spans 40.7 inches from nose to heel, so it's significantly larger than other Nerf guns and a weapon best left to older players. When you need a serious arsenal to regain control over the backyard for the summer, check out the N-Strike Raider Rapid Fire CS-35, which holds up to 35 foam darts at one time so you can shoot at an opponent repeatedly, while using the gun's clear window to check how much ammo you have remaining. The Nerf N-Strike Elite Rampage holds up to 25 darts at one time. Hold down the trigger and slide the handle back and forth to release a steady stream of darts at your opponent. The Rampage works with any Clip System N-Strike blaster and can be customized with Tactical Rail accessories. The N-Strike Elite Retaliator Blaster includes three interchangeable parts so it can be modified to suit specific firing goals. You can attach or remove the stock, assault grip, or barrel extension to customize your weapon. The Nerf N-Strike Elite Hail-Fire Blaster can reach targets up to 75 feet away. It features a high-capacity ammunition rack with four reloadable clips capable of holding six darts each. The Nerf N-Strike Elite Rayven CS-18 Blaster offers semi-automatic speed and the option of added Tactical Rail accessories for more firepower. The included glow-in-the dark clip system makes this gun an ideal choice for playing after dark. The Nerf Vortex line is noteworthy because most of these guns shoot round discs instead of foam darts. The Nerf Revonix 360 Blaster is the furthest firing gun in the line, with a 65-foot firing radius. It can hold 30 discs at a time. It has a Roto-Action barrel that rotates as you fire. 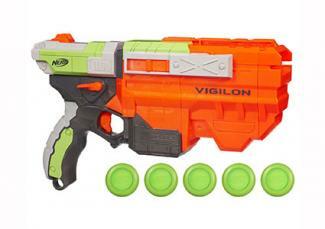 The Nerf Vortex Vigilon holds up to five discs at one time, giving you plenty of firepower for your battle. It's great for shooting far away targets on the move. The Nerf Vortex Praxis features a pump action and a removable 10 disc clip. It can be customized with both N-Strike and Tactical Rail accessories, allowing for a one-of-a-kind weapon for your Nerf war. If the weapon jams, simply point it at the ground and flip the disk eject switch. The Nerf Diatron fires two discs at once and can hold 10 discs in the magazine. It can be upgraded with optional Tactical Rail accessories. The Nerf Vortex Proton Blaster is one of the smallest guns in this line. It's a single shot blaster designed to be quick loading for surprise situations. The Nerf Dart Tag line was first introduced in 2005. These weapons shoot foam darts, but most have a higher firing capacity than the N-Strike models. The Dart Tag line also includes jerseys for kids to wear during official competitions. If you'd prefer to avoid having your child shooting his siblings or the family pet, the Stinger is a great option. This gun comes with a target that kids can use to practice their aim. The Nerf Dart Tag Quick 16 Blaster lets you rapidly fire a series of 16 darts. The pump action handle lets you control the rate of fire and the darts whistle as they fly by. 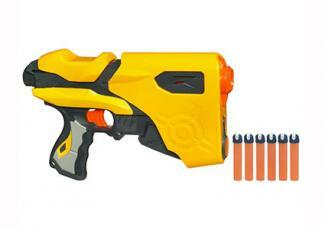 The Nerf Dart Tag Swarmfire Blaster holds 20 darts. It's an electronic blaster that requires 6 C batteries, which must be purchased separately. The stock is removable for added mobility. If you hate reloading your weapon, the Nerf Speedload 6 is a great choice. This air powered blaster has an integrated clip with six darts that whistle as they fly by. The Nerf Sharp Shoot is a quick draw blaster that comes with an easy release belt clip and a four quick release darts. It is also one of the most affordable weapons in this line, selling for just $9.99. The appeal of Nerf guns isn't limited to just boys. For Fall 2013, Nerf introduced a line of Rebelle guns designed to appeal to young girls. The weapons feature stylish pink and purple graphics. The Sweet Revenge kit includes a blaster with a holster and sassy vision gear glasses to prepare girls for their own Nerf war. 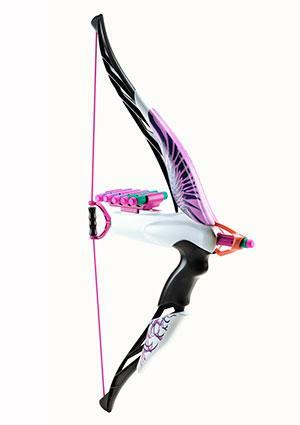 Girls who would prefer to avoid toy guns can check out the Heartbreaker bow, which fires foam darts up to 75 feet. Nerf wars are a popular way for Nerf fans to spend time together. Choosing the right weapon makes it more likely that you'll come out victorious when the battle is finished. 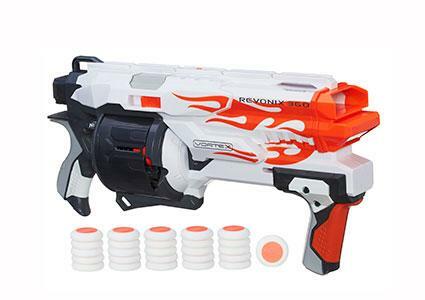 The Maverick REV-6 is one of the most popular Nerf guns. It is very accurate at close range, which makes it an excellent choice for sneak attacks and examining your surroundings. This gun was first released in 2004 as an N-Strike blaster. It can hold six micro darts, but can also fire other darts such as glow darts, streamline darts, elite darts, dart tag darts, and whistler darts. The suggested retail price for this gun is $7.99, so it's one of the most affordable Nerf weapons around. 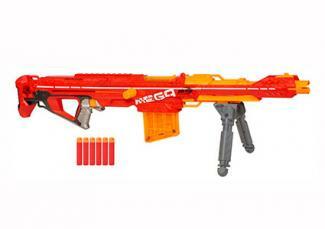 If you have more money to spend, the Stampede ECS is a must-have for your Nerf war. This gun was first released in 2010. The gun comes with three 18-round clips and one six-round clip. It is the only clip-system blaster to be fully automatic and requires six D batteries for play. Nerf guns are safe in their design, as they contain no parts that cause injury during play. However, certain safety precautions should be taken. These guns should only be used in grass, on carpeting, or any other surface that is safe to fall upon. Practice Nerf safety with your kids by limiting where they can play and at what times of day. Smaller children should not run around with a shooter in the dark. All children should wear appropriate clothing and footwear before heading into battle. Modifying Nerf guns to create unique weapons such as double-sided Nerf guns is a popular hobby among adult Nerf enthusiasts. These modifications can affect the safety of the weapons, however. To prevent injuries, do not allow young children to play with Nerf guns that have been modified in any way. Nerf fans typically have a primary weapon and a secondary weapon when they go into battle. A large supply of extra ammo is also important, but remember to check the description of your Nerf gun before buying extra darts or discs. Nerf has several different dart types and some guns only work with a specific type of dart or disc. Nerf doesn't make storage bags, but a backpack that is large enough to comfortably carry all of your Nerf weapons and accessories is a good idea when you're battling away from home.